A south-west view in ink of the Church of St Peter's in the East (St Peter in Eastgate) in Lincoln. This building dates from 1778. 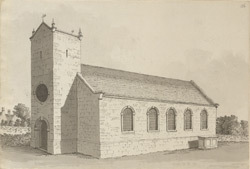 The existing 17th-century church was dismantled when the parishes of St Peter's and nearby St Margaret's were amalgamated. This building was destroyed and replaced again in 1870.